Music in our gatherings and in our lives is a profound gift from God for our encouragement and growth. It is not just crowd control or leg stretching; it is a serious ministry of the word of God. It changes lives and hearts and is far more than being "on a roster". Come and get your petrol tank filled as we hear from God's word about why music ministry is something you are called to, something you are born for – not just something you "help out" with. Come all you tired musos! Come all you who need to have your understanding of music ministry renovated and refreshed... whether you are a muso or not! Skills development in playing together in a way that makes singing much more fun! Learn about the layering of sounds to create a whole. Explore and create a great dynamic through different sections of the song that will really help people connect mind and heart as they sing to God and to each other. This workshop aims to help you grow in your understanding of 'WHY', not just 'HOW' in music ministry. Growing in love for one another in how we play and rehearse is also discussed. Song leaders – how can you lead God's people to sing from the heart with their whole being? This workshop helps you learn how to get people ready to do sing in a way that inspires and sets people free; how to think about this ministry and figure out what you need to work on; how to prepare for it in your LIFE, not just in the week before church... and how to keep from looking like a roo caught in the headlights out the front! Nicky has led many song writing seminars, helping people recognise, encourage and fan into flame the song writing gift. This workshop also talks about the 'X" factor and how to stay in the way of inspiration. 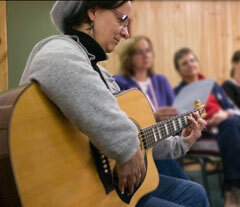 She offers helpful tips and guidelines about melody and rhythm for those congregational songs, and provides analysis and discussion of songs in progress that people bring along to the workshop. MUSIC MINISTRY REVIEW: What makes a healthy music ministry? This workshop covers questions like what makes a healthy music ministry? Is there a checklist? How is our church going in this area? Are we stale and stuck? What are our strengths and weaknesses? What plans should we make for the year to address this? As well as running workshops on this Nicky is able to come and review your church's music ministry in a consulting role (depending on availability). ACOUSTIC GUITAR TUNINGS... more than meets the eye! For costs and bookings, please contact Nicky.